Electroalfa was born with the first forms of democracy in Romania, at the end of the 90s. 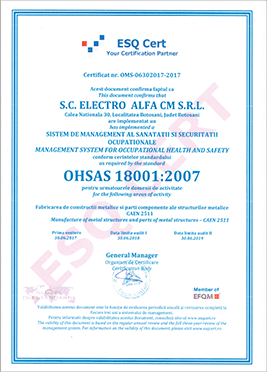 Based on trust, hard work, commitment, respect and continuous adaptation to the partners’ requests, Electroalfa has become a strong Romanian brand, well recognized on the national market and appreciated on oversees markets due to our products and services in the field of energy, industry, infrastructure and buildings. Our passionate team, the advanced management system implemented in our three factories, the Research and Development Centre, the state of the art technologies and the portfolio of complex projects recommend us as an excellent business partner. Electroalfa is present on the specialized market by means of three business units. The business unit of Electrical Equipment and Steel Fabrication Parts manage the company’s products portfolio. The equipment production uses the production capabilities of the three plants from Botosani, Romania. The EPC contracting activity, carried out by the EPC Contractor Business Unit, ensures the use of Electroalfa products into complex, turnkey works, which involve the design and the execution of the investment. In 1991, after just one year of democracy in Romania, a Romanian visionary engineer set up the first company of the Electroalfa Group. In the first year of the company’s existence the serial product – distribution box 1-7 was homologated. Major investment projects are carried out in the company, with the acquisition of new machines: sheet bending machines, shearing machine, electrostatic field painting installation. The local development of Electroalfa company led to the set up of the first branch in Bucharest, Romania’s capital. It was the year when we started our own production of metallic constructions for Electroalfa electrical elements. The quality assurance system according to ISO 9001 was implemented, certified by TUV, CERT and SRAC. The new administrative headquarters is inaugurated. The range of manufactured products increases (power distribution systems, withdrawable slide-boxes) and we begin export to the Republic of Moldova, Great Britain and Nigeria. The first medium voltage switchgear of 12, namely 24 kV were certified. Two more branches are set up in Cluj and Iasi. In the same year, the company develops a new business sector and signs the first contracting works. Products of Electroalfa’s own design, low voltage distribution panels of he DISMOD family were homologated based on the trial reports issued by national and international specialized labs. A new product is launched – the compact transformation station in concrete envelope. The company is organized in a new structure made up of business units: Electrical Equipment,EPC Contractor, Steel Fabricated Parts. The project of the photovoltaic park from Rediu, Botosani county is finalized. The Research and Development Center is inaugurated. The production of the new SCADA PT/PC/PTAb cabinet begins. 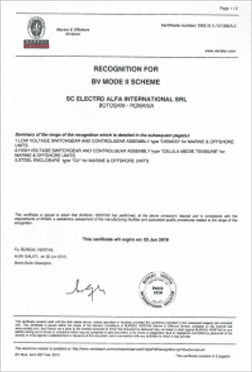 At the same time, Electroalfa buys the SIVACON S8 license and finalizes the modernization project of the metallic constructions plant. A new design office is set up in the Republic of Moldova, at Chisinau, and within the Electric Equipment Division new product optimization processes are carried out, such as: monobloc transformation stations, 24kV switchgear with manual or automated operation. Electroalfa celebrates 25 years of activity and begins the implementation of a new management style based on Kaizen principles. 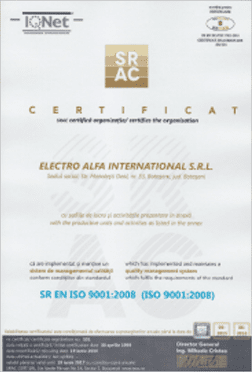 A quarter of a century of continuous activity and experience shared with clients all over the world is the most precious certification of Electroalfa Group.